Kadir Nurman, inventor of the döner kebab, sadly died in Berlin on 24th October, aged 80. The father of the kebab revolution (get it? )* created the snack when he moved to Berlin in 1972. His idea came when he noticed Berliners struggling to make the difficult transition between afternoon beer drinking and evening beer drinking. He put his speciality grilled meat in a flatbread to help soak up much of the alcohol in the eater’s stomach, enabling them to continue on to late-night spots such as Berghain and Tresor. Kebabs are now loved by millions all over the world and enjoyed in far-reaching places such as Scotland (where they are served battered and deep-fried). In the mid-70s, German culinary scientists attempted to create their own rival to the döner kebab but they could not manage to get the paniermehl to stick to such small pieces of meat and the project was abandoned to focus instead on development of the Currywurst. 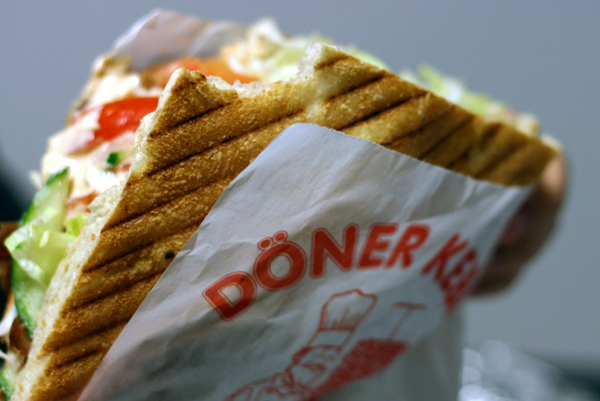 Today, more than 1,000 döner shops exist in Berlin. Per metric ton, kebabs outsell Apple products by a factor of 12/1 (and to think that Steve Jobs got a film made about him… let’s hope Hollywood is reading this). In recent interviews, Mr. Nurman said he was happy his invention has helped thousands of Turkish people to make a decent living. However, he did express concern over the number of ingredients found in modern kebabs. We all know that, now Mr. Nurman has gone, one ingredient will certainly be missing: love. Not much is publicly known about Mr. Nurman’s life. Much like the ingredients of döner kebab meat, it’s a mystery. Instead I’ll echo the eternal words of Marlene Dietrich: He was some kind of a man. What does it matter what you say about people? So next time you’re hungry, buy a kebab to honour the man. Order it with extra knoblauch sauce and onions so you can savour his memory on your tongue until sometime next week. Kadir Nurman. Berlin loves you. *“Döner”, of course, literally means “to revolve”.